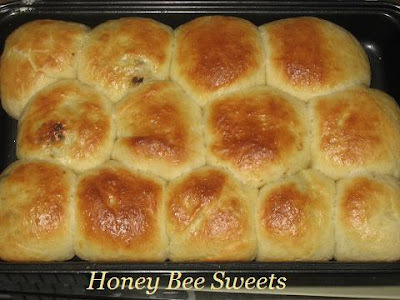 Wonder if you have tasted those half dozen sweet buns with filling, normally mashed red beans, sweeten grated coconut and Kaya, that are usually sold in those traditional bakery stores. Those used to be such a treat as compared to plain white bread when I was a little girl. Nowadays you rarely seen them selling in those brand new bread stores in town...time has really changed, I guess sooner or later no one is gonna sell these good old sweet buns. 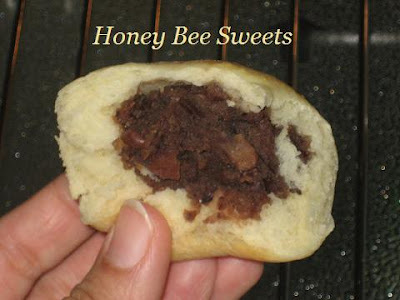 So today I decided to make some red bean buns from scratch....literally, making the red beans filling myself. 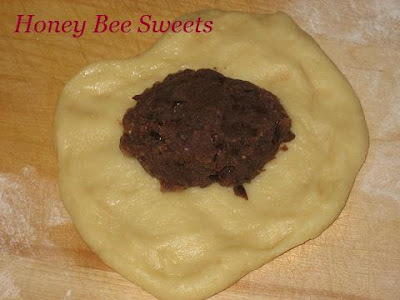 I was quite intrigue by a website, Just Hungry that teaches people to make Adzuki bean paste, AKA. Japanese red bean paste. Equipped with just regular red beans, I took up the challenge and also decided to try out a new sweet bun recipe I found to go along with the paste. In a large mixing bowl, place bread flour, cake flour, sugar, yeast, salt and milk powder in, mix well until all incoroperated. In another bowl, add lightly beated egg, heavy cream and milk, stir to mix well. Make a well in the flour mixture and add liquid mixture into the well. Stir till everything comes together to form a dough. Place dough on a lightly floured surface and knead for about 10 minutes when it feels less sticky. Add the soften butter to the dough and continue to knead till dough is smooth and pulls away from the work surface easily. Roll it into a ball. Place dough into a lightly oiled bowl, cover with plastic wrap and let proof for at least 1½hr to 2hrs. Seal up the dough neatly and roll the dough gently with your palms to make it nice and round. Repeat with the rest of the dough pieces and filling. Place the dough in baking pan to let proof for at least 1hr before baking. Brush the surface of the buns with simple egg wash (1 egg + 1 tbsp milk/cream). Bake the buns for 20 to 25 minutes or till the tops are golden brown. Its such a simple recipe and it's something traditional that's kind of fading out which probably our kids' kids won't see in their future...or maybe they will? Maybe if there's more people like me around whom enjoys making all those traditional dishes from scratch, these good old recipes will last for years to come. :) What can I say...I'm quite old fashion and traditional, haha! ;D Anyway, give it a try and enjoy them! Having gone back to California for 2 weeks sure brought back some good old memories for me. Especially my kitchen...did quite a bit of cooking and baking back then too. 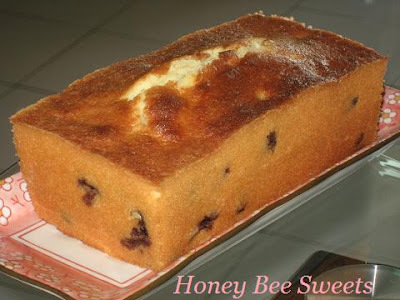 ;) The first recipe that came to mind was my all time favorite Blueberry Cream Cheese Pound Cake. I'm sure good friends of mine in California will agree it's one of their favorite recipe that I've shared with them too. :) All of the people that have tasted it have only rave reviews about it. 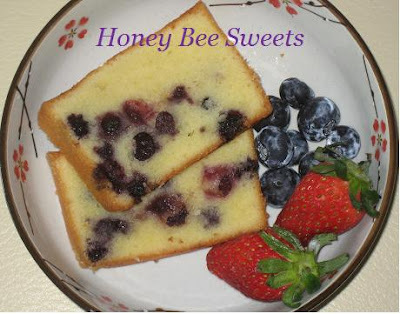 So I was really happy when I saw blueberries in season now, and could not wait to make this yummy recipe! 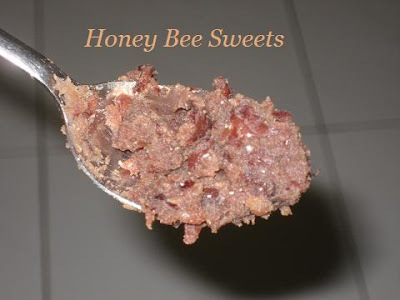 :-D Furthermore the ingredients involved are few and readily available...who would not love this recipe?! Preheat oven to 180°C. With an electric mixer, beat butter and cream cheese until smooth. Add sugar; beat until light and fluffy, about 5 minutes. Add eggs, one at a time, beating well after each addition. Mix in vanilla & lemon zest. With mixer on low, add flour and salt in two additions, beating until just combined. 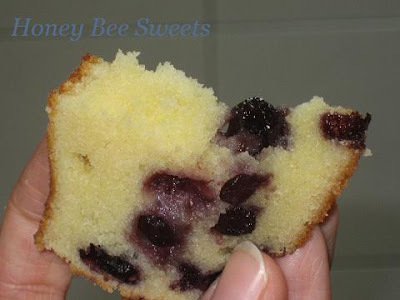 To the blueberries, sprinkle a little plain flour over it, making sure all is lightly coated. ( this will prevent the blueberries from sticking together) Then add the blueberries into the cake batter and stir to combine. Generously coat a 8 1/2-by-4 1/2- by-2 1/2-inch loaf pans (1 1/2 quarts each) with cooking spray; immediately pour in batter (pan will seem full). Tap pans on work surface to eliminate any large air bubbles. Bake until golden and a toothpick inserted in the centers comes out almost clean, 45 to 50 minutes (if the tops begin to brown too quickly, tent with aluminum foil). Cool 10 minutes in the pan. Turn out the cakes; cool completely, with top sides up, on a wire rack. This pound cake is good even after 3 days, just store it in air tight containers and refrigerate it after if it does last that long. :) Here's a close up of the cake....mmm. :) Go ahead and give it a try today, have fun! Heat up wok with cooking oil. Add garlic, Chinese sausage, dried shrimp and dried mushroom and stir fry until fragrant. Add shredded turnip and stir fry. Add seasoning ingredients and stir well till well blended. 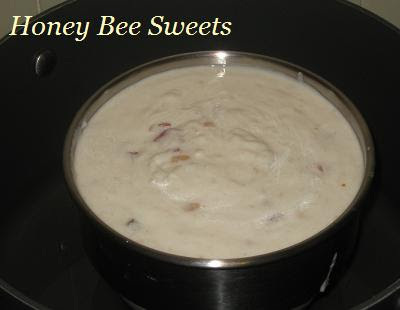 Pour the batter into prepared pan (8 X 8 X 2 inch) and steam for 45 minutes or till it's firm to the touch. 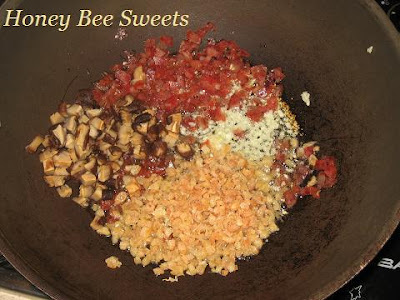 Once the carrot cake has cooled down, cut it into chunks and assemble the following ingredients for frying. Heat non-stick frying pan with 2 tbsp of cooking oil. Add chopped garlic and preserved dried radish and stir fry till fragrant. 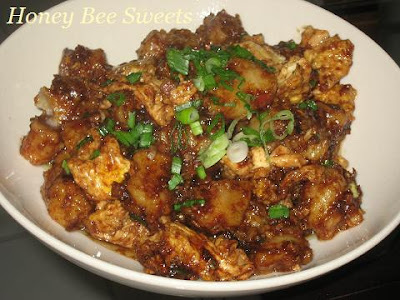 Add carrot cake chunks and fish sauce. Stir fry for awhile. 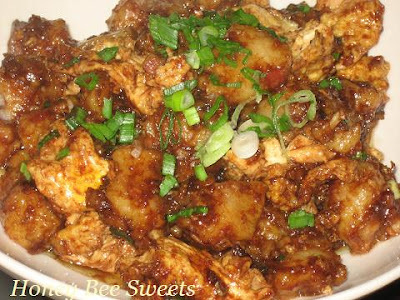 Move the carrot cake chunks aside and add a bit more cooking oil and proceed to add eggs and stir fry till cooked. Turn off the heat. Add Hoisin sauce and sweet dark soy sauce and stir well. Dish up and garnish with spring onion. Serve hot. It's so good with a cup of "teh-si"(chinese milk tea). 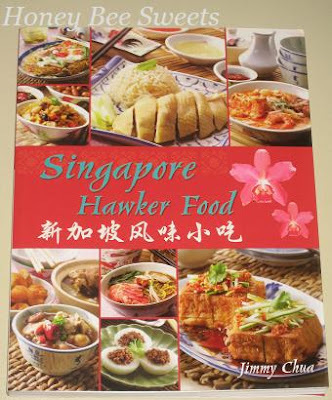 Once you get this mastered, you pretty much can enjoy Char Kway @ home anytime you want and not having to drive down and queue up to purcahse a packet from your favorite hawker. Have fun trying out and let me know how it work out for you. ;) Enjoy! 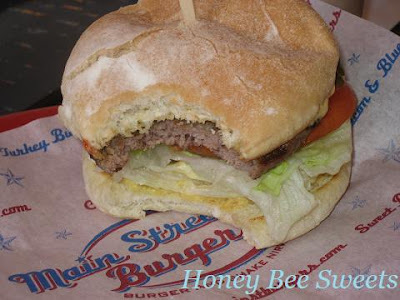 There were a few of my favorite eateries in California that I like to mention in this post. First is a Ramen place in Milpitas call Maru Ichi. I remember my family and I used to frequent this place twice to three times a month while we were in Bay Area. They serve several different soup base ramen, personally I like their Shouyu Ramen the best, not too salty and their noodles have good texture. The left picture shows Kuro Ramen, which is their house special...black colour looking soup, got a spicy kick to it. 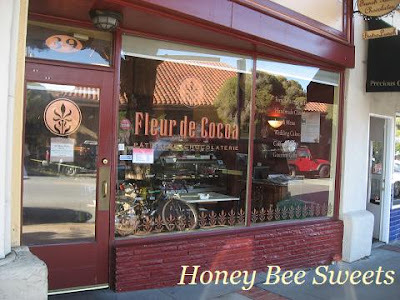 Next stop, we went to another favorite spot in Los Gatos downtown, a pastry & confectionery store call Fleur de Cocoa. I remember during birthdays and special occasions, we'll order a cake from here. They serve no ordinary cakes, I would describe it as "heavenly" or "out of this world"...seriously. But the con side is it's quite $$$$....if you know what I mean. Regrettably, I was unable to make a Valentine's Day post this time, being away and all, not to mention I'm still suffering from jet-lag and common cold. I guess I just need more time to settle back and of course rest. 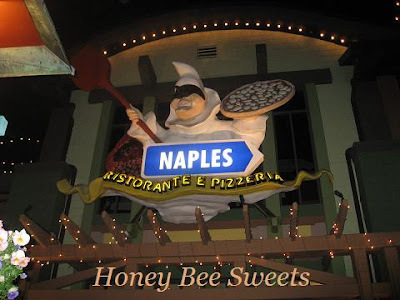 On the evening when we arrive @ the Disney hotel, we went dinning @ this Italian restaurant call Naples Ristorante and Pizzeria. We were famished when were finally seated and we ordered whatever that sounded good to us. The food came fairly quickly and we dive in straight away. 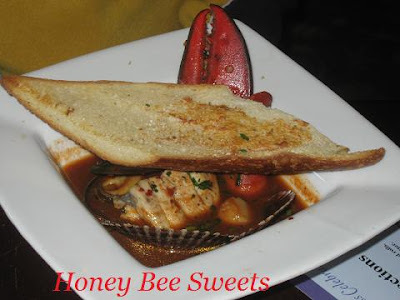 I ordered three cheese ravioli with tiger shrimps and my hubby ordered tangelini with lobster in cream sauce. The kids had pepperoni pizza and meatball spaghetti. I have to say the food was okay, not too fantastic....a little too salty for my taste buds. However my girl's pepperoni pizza taste okay. 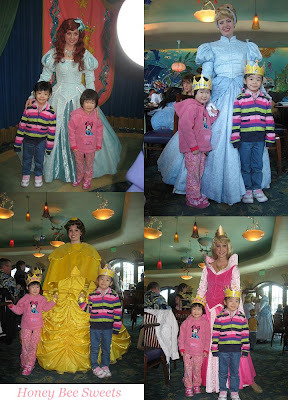 The following day we had a lunch "date" with the Disney princesses! You hear me right...well, technically the princesses just come to your dinning table to talk to you and take photos etc. Well, it's more then you can imagine what it means to my girls! They were totally excited about it the minute we told them. The lunch took place @ this place call Ariel's Grotto. Thank goodness we got to seat indoors because it was quite cold that day. The first thing we did was to meet Ariel herself, we took pictures and were quickly seated down and ordered our food. In the mist of waiting for our food, all the Disney princesses started to come out one by one, first was Cinderella, then Aurora (Sleeping Beauty), then Belle (Beauty & the Beast) and last Snow White. My girls couldn't settle down and eat, because they kept looking and waiting for the Princesses to come to our table! In fact the food has improved quite a lot since 2 years ago when we visited them. 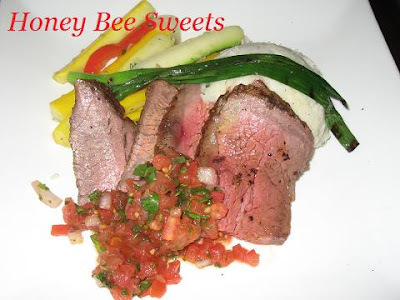 For my main course, I have Santa Maria Style Tri-tip, which is slow roasted over rock salt and smoked with red oak wood and serve with Chedder-herb mashed potatoes and with some seasonal vegtables. While my hubby got Cioppino which include lobster claw, pink scallops, red fish, green-lip(no idea what's that), mussels and shrimp, plus Bibao chorizo (type of sausage) bathed in a robust fire-roasted tomato broth. The girls have thir usual kids meal, pasta and fresh fruits on the side. 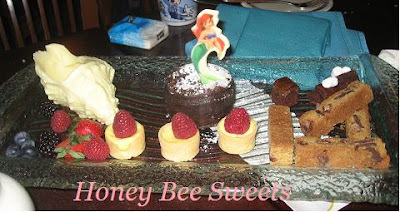 As for desert, a selection of yummy pastry which includes seahorse lava cake, chocolate-chip strips, cheesecake tarts with raspberries, s'more chcoclate bites and a white chcoclate conch shell of garden fresh berries! Everyone was satisfied and happy after this meal...and my girls asked are they gonna have dinner with the Princess later?! Hahaha!! Overall, I had a great trip back to California, but again I feel great too to be back home safe with my family and back to my usual routine. :) So looking forward to more baking in my kitchen too! So stay tune my friends!